No matter what form it takes, negative behavior directed at you hurts. If you’re pushed, hit, or your things are ripped off or trashed, it hurts. If you’re ignored by friends, humiliated by the actions of a classmate, or cruel things are posted about you online, it hurts. If it happens to you, you’ve probably asked yourself, “Why me?” You know how painful it is to be treated this way. 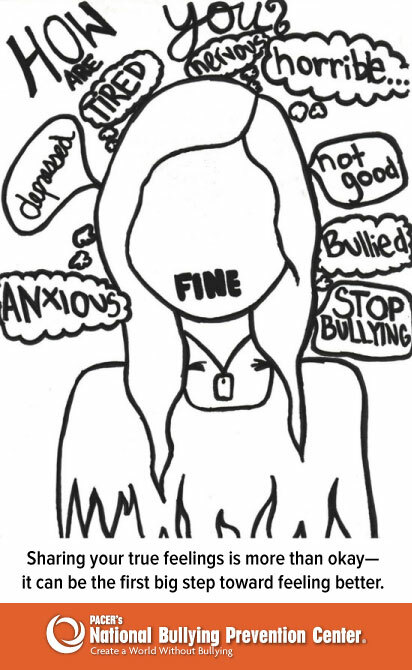 So seriously, if you think you are being bullied what can you do? A lot! It’s not always easy to know what you should do, but it’s important to know that you have options. These steps will help you with ideas. Bullying can happen to anyone—and it’s not always so simple to recognize. Read each of the following questions and check any boxes that you think might apply to you. The more boxes you checked, the more likely it is you are being bullied. Remember, NO ONE deserves to be bullied and EVERYONE has the right to be safe. The next step is to start thinking through possible next steps. It’s important to know that bullying can happen to anyone—and it’s not always so easy to recognize. If you are trying to determine if you’re experiencing bullying, take a look at the checklist below. Read each of the following questions and check any boxes you think might apply to your situation. Do other students make mean comments about you? Have you ever been called hurtful names? Are you teased for how you look or act? Do you feel alone or isolated at school? Has anyone ever spread mean or untrue rumors about you? Are you ever purposely excluded from a group? Have you ever felt that someone you thought of as a friend is trying to control you? Has someone ever touched you in a way that felt inappropriate, demeaning, or threatening? Has anyone ever mocked or mimicked the way you talk or act? Has anyone ever damaged your belongings? Do other students physically hurt you on purpose? Are you ever afraid to go to school? Do you get anxious about how you are treated by other kids at school? Have photos of you been posted online without your permission? Has anyone ever pretended to be you on a social media site? Have people ever posted mean things about you online, or commented in a mean way on things you post? If you are experiencing bullying, think through some of the issues you may encounter, as well as how you can take action. The issue: I don’t want to tell anyone. How to take action: Tell someone you trust. Those who bully depend on their targets being silent, as it allows their behavior to continue without consequences. 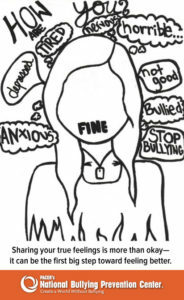 Your natural reaction to bullying might be to isolate yourself from peers and family; it may be too painful, hurtful or embarrassing to even talk about. And yes, it can be really hard to talk about what’s happening. As difficult as it might be, it’s important to connect with someone and share what you are going through. Ideally, you’ll talk about it with your parents or an adult whom you trust. If you don’t feel able to tell an adult, confide in a friend. The issue: I don’t want to be called a snitch. How to take action: Recognize that the goal of using that label is to silence you. Reporting is sharing legitimate information to protect yourself or another person. Tattling is more commonly done with ulterior motives, such as to intentionally get another person into trouble. When you are being bullied, the person bullying you may try to keep you silent by trying to shame you into thinking you are doing something wrong by telling. They want you to be silent so that there are no consequences for their behavior. The issue: I already told someone, and nothing changed. How to take action: Don’t give up; tell another person. If you told an adult about a bullying situation and it wasn’t helpful, continue to be a self-advocate. Know that you have the right to speak up for yourself and let another adult know what you need to feel safe. As a next step, think through who else you can tell, such as a parent, a school administrator, a favorite teacher, a counselor, or another adult in the community who you trust. Then share important information with them, either in person or in writing. Sometimes it’s helpful to remind the adults you speak with about the laws or school’s bullying prevention policy that outline their responsibility in handling bullying situations. Then, ask for advice and their help to address the situation. The issue: I was told this was just the way it is. How to take action: Know there are laws designed to address bullying. There are state and federal laws that provide protections against bullying and harassment. In general, schools will have a bullying prevention policy, which addresses the right to be safe at school. Research your school’s policy about bullying prevention, state laws that apply to bullying, and how to report inappropriate behavior to social media. Learn, on your own or with the help of others, how each of these can be used to assert your rights. State and local laws may provide additional protections on other bases, including sexual orientation. The issue: It’s only happening online. How to take action: Document, block, and report. There are three main action steps when bullied on social media, texting, or other electronic means. Document: Your initial impulse might be to delete a harmful post, but once you do that it could be lost. Instead, think through if you want to keep evidence of the bullying, so that the information can be shared with an adult. Take a screen shot and save it to your files or capture the content in a manner comfortable to you. Block: Remove the opportunity for the person to contact you. Report: Tell someone what’s happened. Just as you deserve to be safe at school, you deserve to feel safe online, too. Let someone know, your parents or a trusted adult, and show them the evidence of the bullying. You can also report the individual to the social media or service provider. The issue: I’m told that I don’t fit in. How to take action: Find others with similar interests. Learn to embrace and nurture what sets you apart. There can be incredible pressure, especially during the teen years, to be “just like everyone else.” Yet, the irony is that no two people are the same. Think through what you like to do, and then seek opportunities to connect with those that share your interests. It might be hard to recognize right now, but the very attributes, talents, or interests that you are being teased about are often the traits that eventually become your strengths. Think about the person interested in technology who could go on to pursue that computer science degree, or the child who spends all their time reading and grows up to write best-selling novels. The issue: I’m being bullied by my teacher, coach, or another adult. How to take action: Talk with your parent or guardians. Bullying is about power and the power dynamic between an adult and student usually favors the adult. It is generally not helpful, and often not safe, to confront an adult about their behavior. It’s important that you share what’s happening with your parents, guardians, or a trusted adult, as their advice and action is critical in this type of situation. The issue: I’m being bullied outside of school. How to take action: Do your best to remove yourself from the situation and report it. Bullying can happen in the neighborhood where you live, at your favorite store, or on a city street. It’s important to know that most laws address bullying that happens at school. If you are being bullied, for example, during the summer or on weekends at your local park or grocery store, report it to the adults who are in charge. This might be the store owner, the park patrol, or even a police officer. Most bullying happens outside the view of adults, which makes it very important that you report it, so adults can keep you safe and hold those who are bullying accountable.